Kaili Chun and Hongtao Zhou. Net_work. Fishnets. The Artists of Hawai’i biennial exhibition, including work by Kaori Ukaji and Kasey Lindley, continues at the Honolulu Museum of Art through May 28th, 2017. 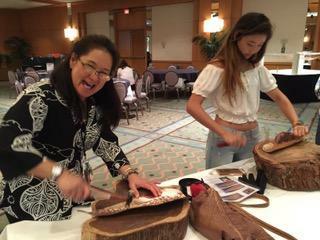 Kaili Chun holds a bachelor’s degree in Architecture from Princeton University and a master’s of fine arts degree from the University of Hawai‘i at Mānoa. She currently serves as a lecturer at Kapi‘olani Community College, and is earning a PhD in Architecture at the University of Hawai‘i at Mānoa. 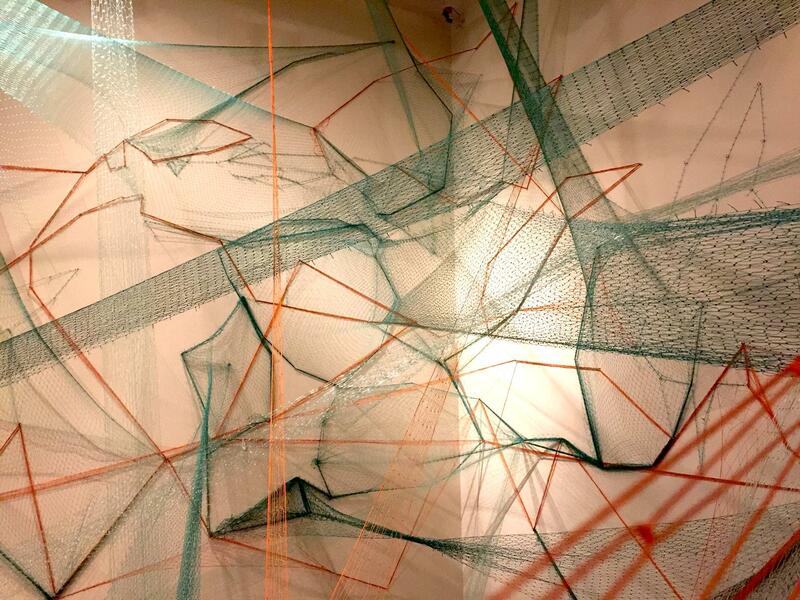 Kaili Chun discusses two pieces, Net_work, a collaboration with Hongtao Zhou, and Hulali i ka La, an installation at the Prince Waikiki Hotel. Artist Kaili Chun and Arts of Hawaii curator Healoha Johnston expand on the development of ideas for Net_work, and Chun describes her process for Hulali i ka La. 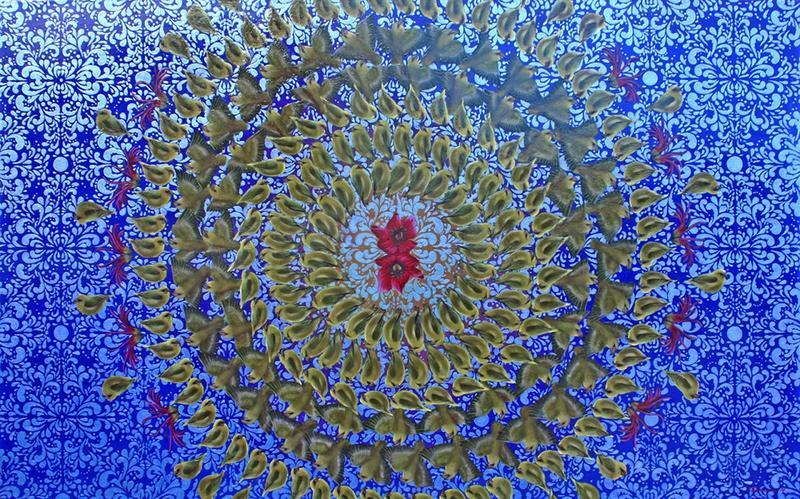 Artists of Hawai’i, with work by Kaili Chun, Hongtao Zhou, Kaori Ukaji and Kasey Lindley, continues at the Honolulu Museum of Art through May 28th 2017. 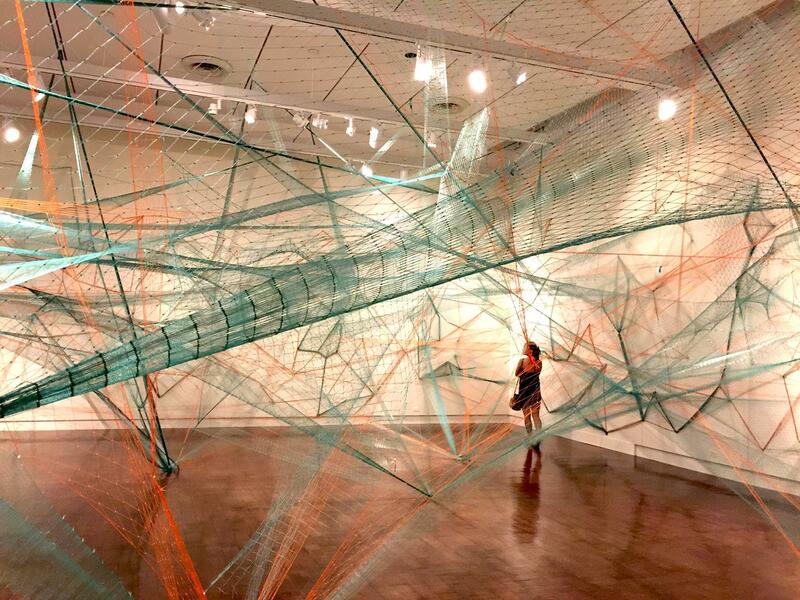 Art soars when content and means/materials come together, in the Net_work installation at the Honolulu Museum of Art, for example. Part of the Artists of Hawai‘i show, Net_work was created by Hongtao Zhou, currently out of the country, and Kaili Chun, here. Chun: For me, it was this telephone was a catalyst for understanding how dependent we are on different systems and networks. Arts of Hawai‘i Curator Healoha Johnston conceived of the collaboration, sensing an affinity between these two architects and their attachment to materials. Johnston: They wanted to arrive at a language that made sense for both of them but that also made sense for Hawai‘i. Which is how they arrived at the nets. I remember having coffee at Kaimukī Superette and we were talking about bamboo and steel, and all these different options and the properties that make those materials interesting. Then, subsequent conversations about fishnets and all the different implications associated with fishnets, including economic systems that are tied to them. and the way they could physically stretch across the gallery and sort of reproduce the invisible systems in a really interesting visible way. Emmployees of the Prince Waikiki were an integral part of the construction of Kaili Chun's Hulali i ka La. 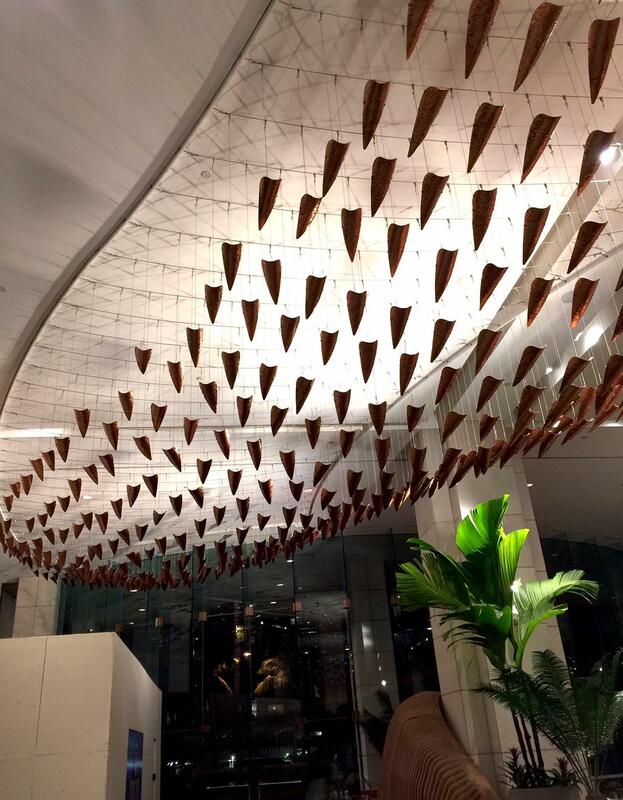 Over 600 of them including top executives, hammered 825 copper hinana fish for the installation. 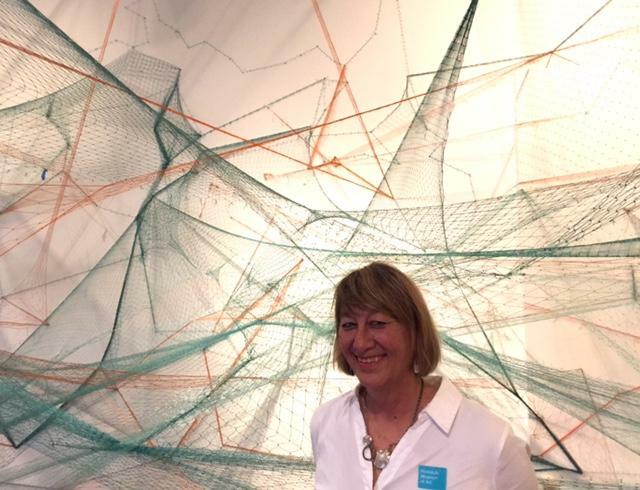 Chun says the nets are a metaphor for invisible systems that we don’t think about but are so heavily invested in---the large gallery is elegantly webbed from corner to ceiling to floor to walls with translucent veils of aqua and salmon pink nets. Chun: The nets are just a metaphor for other invisible systems that we actually don’t think about but that we are so heavily invested in. That’s what this piece is actually about. What we did here was we projected different maps of different systems and networks onto the walls so we have maps of shipping routes, airline routes, contagion routes, agricultural areas where most of the food is produced to feed the world. We have transportation routes like rail and roads and electricity, natural gas lines, oil pipelines, internet server cities. Kaili Chun. Hulali i ka la. Mixed Media. (detail) Eight hundred twenty five copper hinana fish are suspended from the ceiling of the lobby of the Prince Waikiki Hotel. This glittering school recalls the abundance of fish that used to live in the brackish waters of the shoreline where the Prince is located. Chun and Zhou were actually drawing with nets, tracing connections between different types of systems. Chun: We think of this thing as a cloud but it actually goes someplace physical where it gets stored. When we layered those projections onto the walls, we drew with the net, so we used it as a drawing material and we connected those dots, so to speak. Then we’d lay another map on top of that, so it’s multilayered on the walls. After we were done with that particular map, we’d move to another map, and then we’d draw with the nets on that map then we’d extend those nets across space and literally connect them to other maps. This thing not only looks incredible, every point represents something. All these different systems are overlaying each other and we’re just tangled inside them. Kaili Chun. Hulali i ka la. Mixed Media permanent installation at the Prince Hotel Waikiki. Chun: We can find our way through. We can crawl through, we can dance through it, or run through it.but we are in it.literally, and we have to become more aware of where we are in the systems that we use and systems that we depend on because it impacts everyone. It impacts everyone else, not just us, so we have to look beyond the self and the selfie, to the whole world. Johnston: There are moments of beauty in this installation that I absolutely did not expect, even though I sat in here and witnessed every minute of the installation. Like this canopy emerged unexpectedly, it was not predetermined. But in the end I think they achieved a strong balance of composition and chaos. There are moments of chaos here, and there are moments of drawing with finesse, using these really strong lines to create a shape. Kaili chun. Hulalai i ka La. 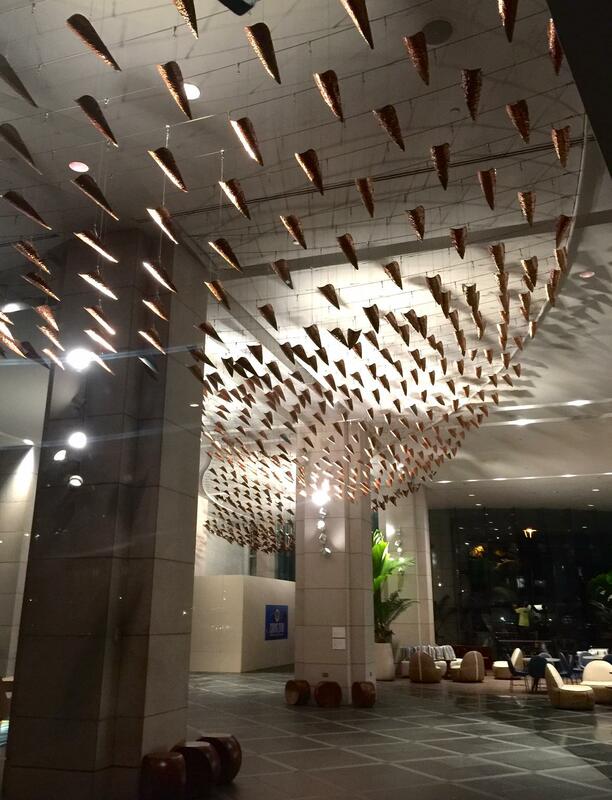 Mixed media permanent installation at the Prince Waikiki Hotel. Chun: Hulali i ka la. What an amazing opportunity to work with so many people, I am so grateful, I am so blessed to have worked on that piece. One day I saw Mrs. Gussie Bento, she’s a quilter, she worked at Kamehameha for forty years. She had a grand aunt that used to live there before all of this was developed. She speaks of the muliwai where the wai meets the kai, where the fresh water meets the ocean, and she recalls that her grand aunt used to bend down and grab these little fish out of the water and pop them into her mouth. That’s what Hulali ka la is. The copper forms are based on the hinana, and the hinana are baby ‘o‘opu. When she said that, it was affirmation to the research that Group 70 did and the history of the land. 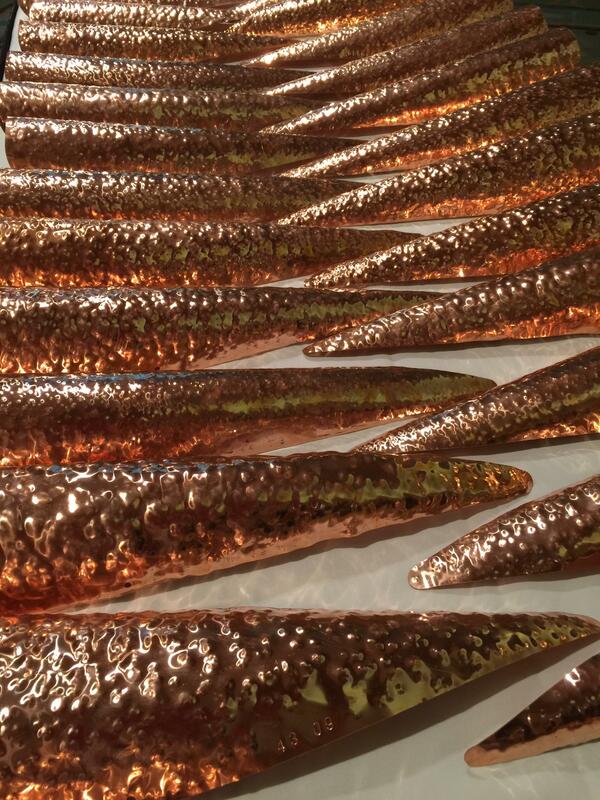 Chun calls it a collaboration with Mari Kim Johnson of G70, Prince Hotel designer Craig Lovett, Nicholas Bright her assistant, and the over 600 hotel employees and others who hammered eight hundred twenty five copper fish. Classmates from Kamehameha also rallied to provide key support. Each fish is numbered, and signed by its maker. Chun: Because each employee hammered a form, they now know the true history of this place, and they can now tell that story, that’s how we keep the place alive. That’s how we keep the memory and the narrative alive, the true narrative, not of the recent history but the authentic history of this land. They know that story now. And now it’s their responsibility, it’s their kuleana, to tell that story. That to me is extremely important. In case you're wondering, yes, even the top managers from Hawai‘i and Japan hammered fish, which were blended seamlessly into the whole. Chun: I am so grateful to every single person that participated, I’m so grateful for everyone that made this opportunity happen, because it’s a once in a lifetime thing for sure. Maybe not. Kaili Chun has just begun working with Group 70, toward closer integration of art, architecture and place. Kaili Chun. Veritas II. Installation. 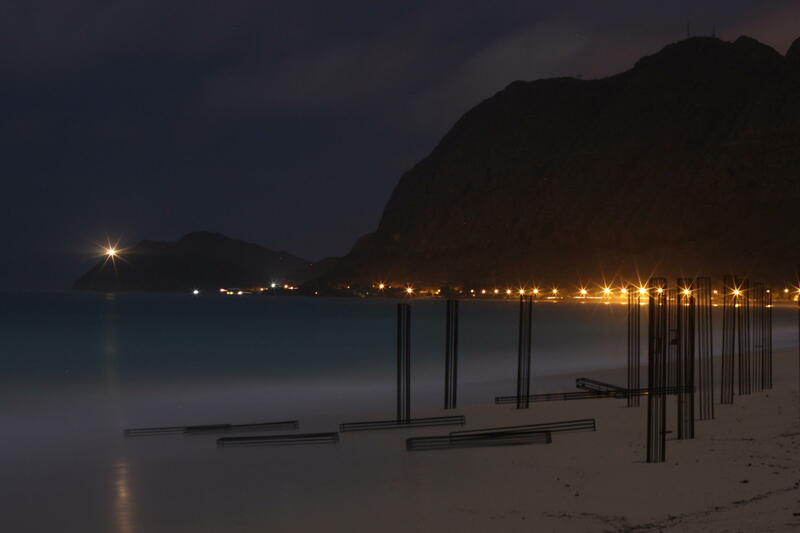 On November 30th, 2012, Artist Kaili Chun staged a 24-hour installation of fifty 8-foot steel cells on Waimanalo Beach. New Stadium at UH Mānoa? Beach Volleyball & Rugby too? The UH Athletics Department is looking at ways to energize its area there in the quarry on the Mānoa campus. They turned to the UH Architecture Department for ideas on how to create a vibrant community feel, stretching from upper campus through lower campus, into the community as a whole. 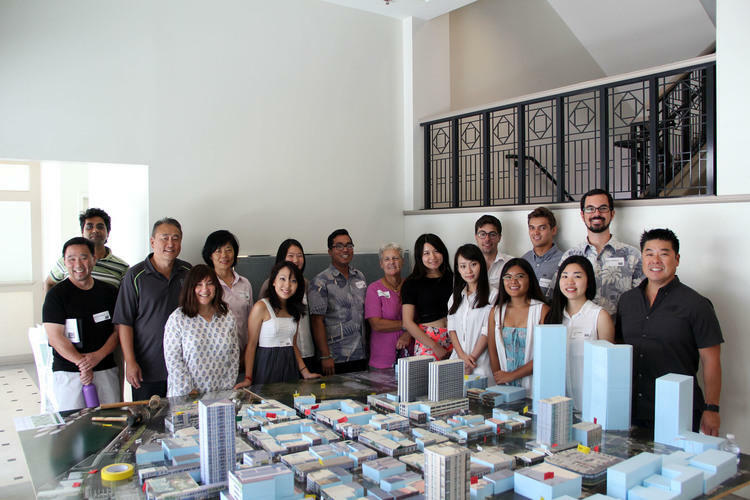 HPR’s Noe Tanigawa reports on a very special project and the ideas it generated. People around the nation and world are using development as a community organizing tool. Change becomes a reason to work with others and improve their neighborhoods. 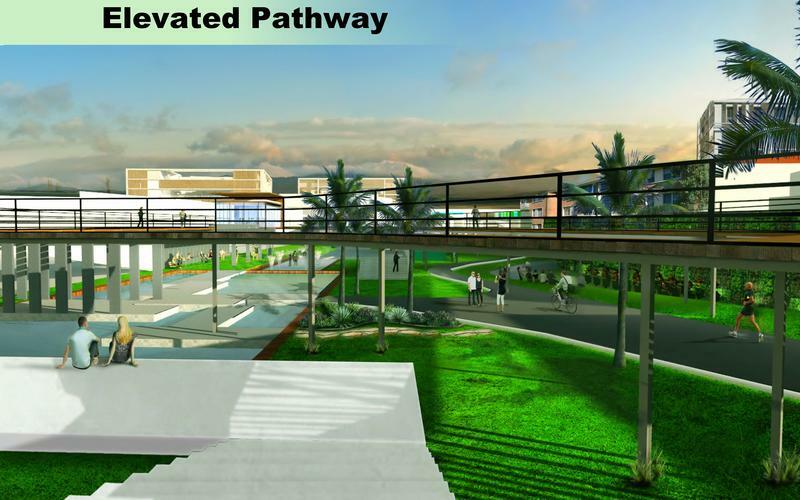 Now, the UH Mānoa Architecture School is convening designers, government leaders, and community members to inject fresh ideas into Honolulu’s development plans. 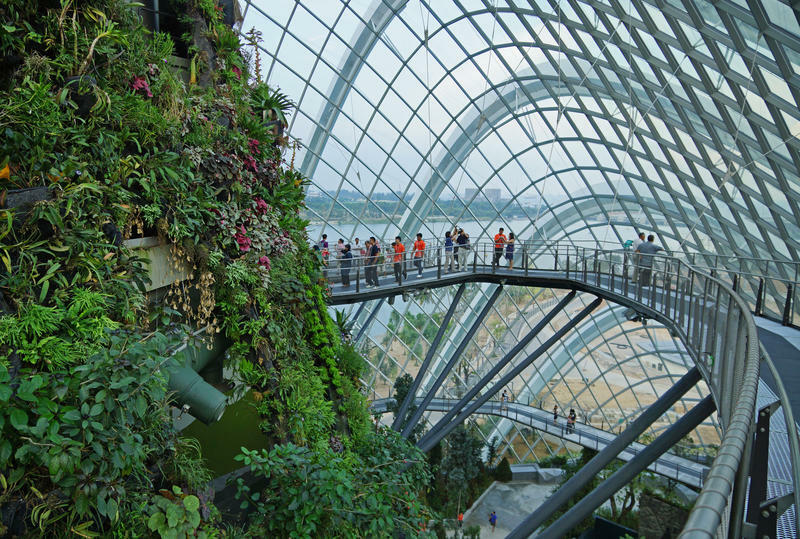 HPR’s Noe Tanigawa reports on the Building Voices Symposium and Design Competition set for Earth Day, April 22nd .